Excel VLOOKUP function, in its basic form, can look for one lookup value and return the corresponding value from the specified row. But often there is a need to use the Excel VLOOKUP with multiple criteria. One can argue that a better option would be to restructure the data set or use a Pivot Table. If that works for you, nothing like that. But in many cases, you are stuck with the data that you have and pivot table may not be an option. Now there are two ways you can get the lookup value using VLOOKUP with multiple criteria. It makes it easy to understand what’s going on in the worksheet. Now, don’t get me wrong. I am not against array formulas. I love the amazing things can be done with array formulas. It’s just that I save them for special occasions when all other options are of no help. We create unique qualifiers for each instance of a name and the exam. In the VLOOKUP function used here, the lookup value was modified to $F3&”|”&G$2 so that both the lookup criteria are combined and are used as a single lookup value. 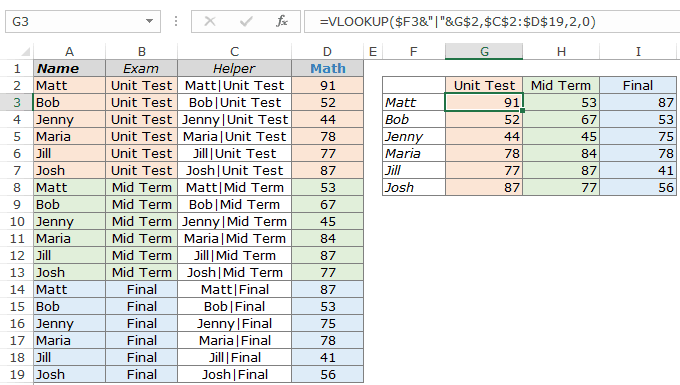 For example, the lookup value for the VLOOKUP function in G2 is Matt|Unit Test. Now this lookup value is used to get the score from C2:D19. 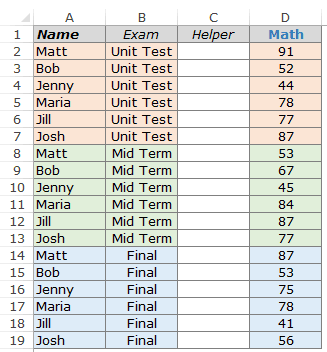 Why did I insert the helper column between column B and C and not in the extreme left? – There is no harm in inserting the helper column to the extreme left. In fact, if you don’t want to temper with the original data, that should be the way to go. I did it as it makes me use less number of cells in the VLOOKUP function. Instead of having 4 columns in the table array, I could manage with only 2 columns. But that’s just me. 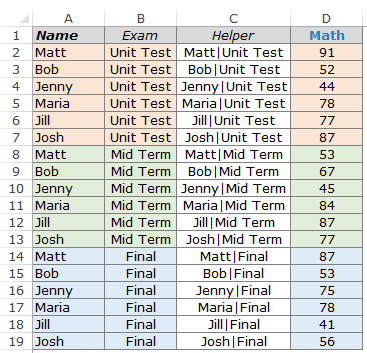 Using array formulas instead of helper columns saves you worksheet real estate, and the performance can be equally good if used less number of times in a workbook. It’s an array where a comma represents next cell in the same row and semicolon represents that the following data is in the next column. 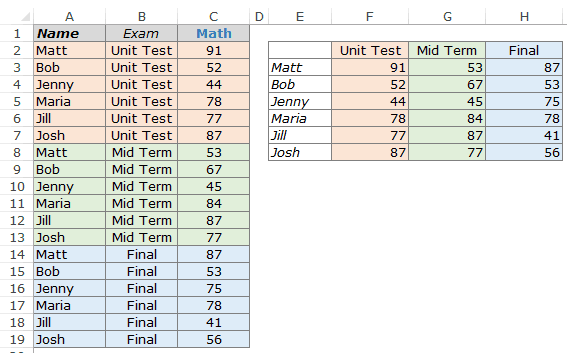 Hence, this formula creates 2 columns of data – One column has the unique identifier and one has the score. VLOOKUP Vs. INDEX/MATCH – The Debate Ends Here!. 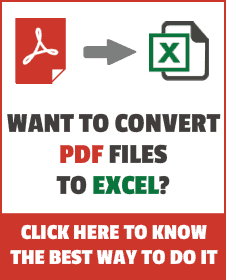 It is found that your website is providing very good information on MS Excel. I am looking for information on selection of multiple values into a dropdown list based on the selection from another dropdown list. Hello, many thanks for your very useful tips, however I didn’t found any answer related to the following issue. The formula on column I should return the exchange rate for the currency on column N related to the date on column C (another sheet). If there isn’t an exchange rate to that day, it should return the immediately previous date’s exchange rate. My issue is how can I write the formula to return the exchange rate to the currency to the immediately previous date? Thanks a lot for your help. Hi Sumit! Thank you for the tip. Is there a way to use this if the info you need is to the left of the info you have? I had ran a macro to insert a column and concatenate the info to the column A. Your tip here looks easier. Will it go left too? Hi Sumit, Thanks a lot for your tips and I have started excel in excel, I have a small issue while copying a set of numbers from one other excel column. I have pasted it and tried to sort assenting order. But they have a “space in the front” and not responding to my command. How to overcome this issue. Thanks for commenting Wong.. I mentioned the same in the article too. 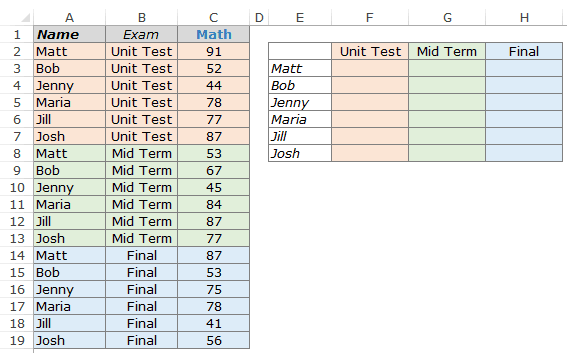 Pivot Table works really well and are easy to use, but need to the data to be structured in a required format. And if you are looking to fetch only a couple of values (let’s say in a dashboard), then VLOOKUP (or Index/Match, Sumproduct) could be the way to go.